It was in late 2016 that Marc Cameron, author of the New York Times bestselling Jericho Quinn Thriller series, was chosen to continue Tom Clancy’s beloved Jack Ryan series. As a long-time fan of Clancy and his work, Marc was thrilled to take over the reins from established author, Mark Greaney, and continue to bring to life characters that’ve been known across the globe for some time. Being a retired Chief Deputy U.S. Marshal, Marc Cameron has spent nearly three decades in law enforcement. That wealth of experience—combined with a second-degree black belt in Jujitsu, certification as a scuba diver and man-tracking instructor, being an avid sailor and adventure motorcyclist—certainly makes this author the perfect candidate to pen high-octane suspense thrillers. Suspense Magazine (S. MAG. ): “Oath of Office” is the latest book; give us the inside scoop. Marc Cameron (M.C. ): Where “Power and Empire” hearkened back to “Without Remorse,” “Oath of Office” has shades of “The Cardinal of the Kremlin.” There is some interesting tech, and the sophisticated weaponry that Tom Clancy readers have come to expect, but like “Cardinal,” “Oath of Office” is a book about spies and the intelligence officers who run them. President Jack Ryan has his hands full with an influenza epidemic, flooding in the southern states, a congresswoman who wants to see him fail, and a so-called Persian Spring which Ryan believes is not what it seems. Ding Chavez, John Clark, and the other Campus operatives bounce around Portugal, Spain, Afghanistan, and Iran, hot on the tail of a Portuguese arms dealer and his girlfriend who is also a talented assassin—who both appear to be in bed with Russian intelligence. 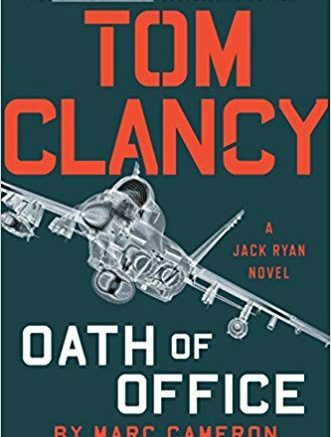 Let us just say that in “Oath of Office,” Jack Ryan gets hit with three things…and then some. MAG. : When you were asked to write Tom Clancy, what was your first reaction? M.C. : My wife and I were on a beach in Florida working on “Open Carry,” the first book in my new Arliss Cutter series, when I got the call from my agent, Robin Rue. She let me know that Mark Greaney had recommended me for the gig. I’ve been a Tom Clancy fan since I was a rookie policeman and read “The Hunt for Red October,” so it was more than a little surreal. My wife saw me talking on the phone and thought someone had died. For some reason, she took a photo. She took another only a few minutes later…after I’d collapsed in the sand. MAG. : What was/is the most difficult part in writing a series when the original author has passed away? M.C. : Mark Greaney is a talented writer, so I was concerned about trying to fill his shoes, let alone Tom Clancy’s. Mark has been a big help as we continue to make the transition, filling in the blanks with character traits and other details from the Jack Ryan Universe. I knew going in that there would be people who were upset that Mark was no longer writing the books, or that anyone other than Clancy was continuing his characters. I also knew that there was no way I could get away with trying to imitate Clancy. So the editor, Tom Colgan, and I, decided from the start that I would write a Marc Cameron book in the ‘spirit’ of Tom Clancy. 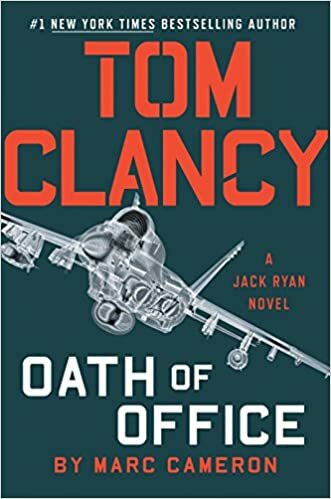 I want to keep the characters true to what Tom Clancy envisioned and strive to tell an authentic story that readers who want more of Jack Ryan, Mary Pat Foley, John Clark, Ding Chavez and the rest, will enjoy. MAG. : In “Oath of Office,” the story drives at 90 mph. Is it hard to pump the brakes sometimes? M.C. : I like the speed analogy. I try not to pump the brakes much. To carry the image a little further, I’d rather “drift” the rear tires around the corners at speed, retaining just enough control to stay on the track. That said, there has to be some exposition, a time for readers to catch their breath. I once had a reader tell me she read my Jericho Quinn books from between splayed fingers. That’s the effect I’m trying for with every book. MAG. : When writing a military/thriller, why do the details matter so much? M.C. : I think it’s possible to push the envelope and make some things up—but we can’t get things wrong. I transposed some numbers in the half-life of a plutonium isotope once and immediately heard about it from a nuclear physicist. I was happy a physicist was reading a Jericho Quinn adventure, but embarrassed that I’d made a mistake on something so simple to check. Describing the sound of a Glock’s safety “snicking” off, or calling a pistol magazine a “clip” lets those versed in small arms know that the writer doesn’t have a clue about weapons. Some readers might read an unrealistic fight scene and think it’s cinematic; others, who are martial artists, might say, “That could never happen!” if some obvious mistake is made. I’m pretty sure his mom wouldn’t have let me bring that up around the dinner table, but that tiny fact in a book lends a certain verisimilitude to those who’ve been there. If a writer points out little details like this, then the people who didn’t realize it learn something new. Those that were already in the know are likely to buy into the rest of the story if the little things are correct. MAG. : In thinking about the villain, what personality traits did you want to make sure came through on the page? M.C. : I’m often asked about all the “evil people” I’ve investigated, hunted, and arrested during my time as a police officer and Deputy U.S. Marshal. I’ve met hundreds of men and women who have done evil things, but only a few whom I would consider truly evil—lacking any good at all. I spent a couple of weeks in jail in Mississippi guarding three witnesses we’d flown in to testify in a federal trial against the “Dixie Mafia.” Two of us were on the inside, associating with all the inmates daily: doing pushups, eating meals, playing cards. Two of our witnesses had been on death row but had their sentences commuted to life without parole. I learned a lot from these men, listening to their stories, how they viewed themselves. Everyone is the good guy in our own story. There are several villains in “Oath of Office” and I worked hard to make even the worst of them believe in what they were doing. MAG. : How did your original work prepare you to take on the Clancy series? M.C. : I knew I wanted to write long before I got into law enforcement. But I was fully aware that once I pinned on the badge, I was in a position to experience things that not everyone gets to (or wants to) experience. Cops are, for the most part, great tellers of war stories, especially when we’re around other cops. At Thrillerfest and Bouchercon I often find myself drawn into conversations with Simon Gervais, Sean Lynch, Rip Rawlings, and others who were either in law enforcement and/or the military. These folks know what they’re talking about and it’s fun to listen to them. As writers, it’s certainly possible to imagine things we’ve not experienced. I’ve never been shot, for instance, so I’ve had to make up the details when it happens to one of my characters. I have, however, been dragged by a car, cut, and been nose-to-nose with people who were trying very hard to kill me. None of that is essential to writing a thriller, but it doesn’t hurt either. Perhaps even more important, law enforcement types have to be keen observers of the world and people around us—a skill also suited to being a novelist. MAG. : Is there a point when you are writing that you think, “I’ve gone too far,” and have to pull it back? M.C. : When I set out to write a novel, I imagine two scales. The first, with “plausible” at one end and “implausible” at the other; the second with “probable” and “improbable” at either end. The Clancy novels and my new Arliss Cutter books tend to tick further toward the probable and plausible end of both scales. While the Jericho Quinn plots are always plausible, parts of them lean a little more toward the improbable—but only a little. Clancy had a way of teaching new things when he wrote, like a beloved professor. I can’t imitate him, but I can strive for that same sort of decorum. MAG. : Do you read your reviews? If so, do you let it affect your writing at all? M.C. : I don’t. I used to, but nothing good can come from it. I could get twenty five-star reviews in a row and feel uncomfortable with the praise. A single one-star would gut me if I was having a crummy writing day. I’ve spent most of my life dealing with bullies face-to-face and I find so many reviews bullying. By the time reviews come out, the book is written and I can do nothing more with it. Some people live to pick at others. I don’t feel like giving them a voice in my head. There are enough of my own in there already. As far as giving reviews, if I like a book, I’ll give it five-stars. If I don’t, I keep it to myself. Writers have it tough enough without being torn down by other writers. I do, however, read and answer my emails. MAG. : What is next for you, either your own work or the next Clancy book? M.C. : I have an Arliss Cutter novel called “Open Carry” coming out the end of February from Kensington. It’s a mystery about a contemporary Deputy U.S. Marshal based in Alaska, so it’s near and dear to me. I’m working on the second in that series at the moment. I’ll start my third Tom Clancy in January. More details on that will be coming soon. And, of course, there are more Jericho Quinn novels in the works—one that will be out later next summer. In other words, the five-star “hits” of Marc Cameron will keep on coming. To follow his upcoming works, news and events, check out https://marccameronbooks.com. Be the first to comment on "Interview with Marc Cameron, bestselling author of the Tom Clancy / Jack Ryan series"